According to ICAR (Indian Council of Agricultural Research) soils are divided into 8 categories. they are alluvial soils, Black cotton soils, Red soils, Laterite soils, Mountainous or forest soils, Arid or desert soils, Saline and alkaline soils Peaty and marshy soils. Alluvial soils cover 24% of land surface in India and is found in Indo Ganga – Brahmaputra plain, coastal plains and river valleys. These are also found in foothills regions in plenty. It contains sand, loam and clay in different proportion. Khadar – which are newer alluvium. it is the soil deposited by the rivers every year. It is more fertile than the Bangar. Bangar – which are older alluvium. It contains pebbles and calcium carbonates. The colour of alluvium soils can be grey, light brown or yellowish. these soils are very rich in chemicals like Potash, Phosphoric acid, lime and carbon compounds but are deficient in Nitrogen and humus. It is formed by weathering and erosion of volcanic lavas and hence found mainly in Deccan lava plateau. It is the most suitable soil for dry farming. These are dark black in colour due to presence of ‘Titaniferrous Magnetite’, a compond of iron and aluminium.regur soils show high swelling on wetting and high shrinkage on drying due to the presence of Montmorillonite mineral. Regur soils have high moisture retaining capacity, therefore suitable for Cotton, coarse grains, sunflower and citrus fruits but not suitable for heavy irrigation. these soils are deficient in Nitrogen, humus and phosphoric acid but rich in lime, potash, iron, aluminium, calcium and magnesium. Red soils develop generally on disintegration of crystalline and metamorphic rocks in the areas of heavy rainfall. hence are rich in ferro magnesium minerals and the red colour of these soils is due to excesssive presence of Iron oxide. These soils areporus and coarse grained and having low moisture retaining capacity. So, it is relatively less fertile soil and needs heavy and frequent irrigation for agriculture. In the low lying areas, it is found as clay and in the higher land, it is found as unconsolidated soil. In the higher parts, it is suitable for growing bazra, groundnut and Potato whereas in low lying areas, rice, ragi and vegetables are grown in it. These soils are rich in iron, magnesium and aluminium compounds, but poor in lime, humus, nitrogen and phosphoric acid. Laterite soils is formed in the areas of heavy rainfall (200cm or more) due to washing away of lime and silica and these are mainly found on top of hills and mountains in humid climate such as hills of Deccan plateau, Western Ghats, top of Eastern Ghats, Assam, Mysore, Malabar & Rajmahal hills. These are residual in nature which are formed under typical monsoonal conditions. The process of formation is called leaching. In leaching process, siliceous compounds of soil are washed away by heavy rain in hot climate and sloppy terrain, hence such soils are deficient in siliceous compounds. These soils are not very fertile but proved to be suitable for bushes and pastures only. With the help of fertilizers, this soil can be made suitable for the cultivation of plantation crops such as coffee, coconut, cashew nut, ragi etc. These soils are rich in oxides of iron and aluminium but deficient in nitrogen, phosphoric acid, lime and potash. Variations are found in these soils due to various climatic and ecological conditions in which they are found. These soil contains kankars, stone pieces and pebbles, differ from place to place depending upon climate. These soils are, yet. under formation process. These are distributed in Himalayas, Vindhyas, Satpura, Nilgiri and other mountains of India. These are acidic in nature due to excessive presence of less decomposed humus. These soils require fertilizers for agricultural purposes. In the regions of heavy rainfall, it contains more humus. therefore, in these regions it is suitable for the cultivation of various fruits, wheat, maize, barley etc. These soils are rich in organic matter and humus but poor in potash, phosphoric acid and lime. Acid and desert soils are distributed mainly in acid and semi-acid regions of Rajasthan. It comes sand in large quantities and is suitable for the cultivation of crops like Jowar and bajra. But, wherever irrigation facilities are available like Sri Ganganagar of Rajasthan, wheat and cotton are also grown in it. These soils are light in colour and contain high soluble salts and phosphorus in large quantities, but lack in carbon compounds and nitrogen. 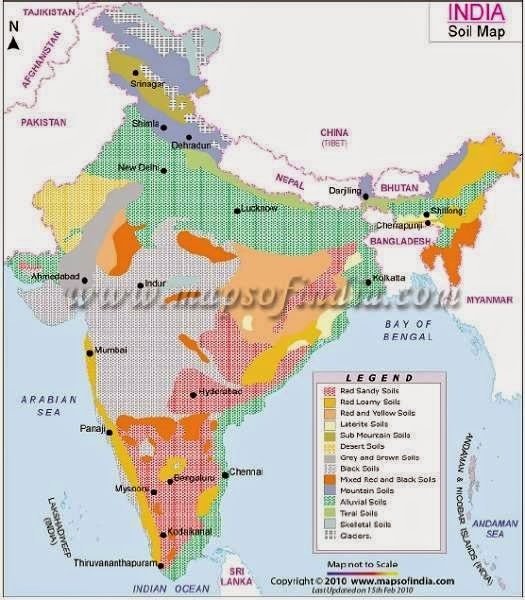 These soils are found in area of arid and semi arid parts of Rajasthan, Punjab, Haryana, Uttar Pradesh, Bihar, Maharastra and Tamil Nadu. These soils are found in patches and are locally known as Reh, Kallar and Usar. such soils are infertile and not suitable for agriculture. These soils can be treated by irrigation with mixing lime and gypsum and by growing anti-salinity crops like rice and sugar cane, cotton, wheat, tobacco etc. Excessive amounts of sodium and magnesium cause salinity in the soil, while higher amount of calcium cause alcanity. So, these are unsuitable for agriculture purposes. TThese are deficient in nitrogen, poor in water holding capacity. These soils are formed due to accumulation of large quantity of organic matters under water-logged conditions for long periods. These are mainly found in coastal areas like Orissa, West Bengal, Tamil Nadu and Kerala in various patches. n Kerala. such soils are also called as Kari. These soils are highly saline and deficient in phosphate and potash. so, this soil is useless for agriculture. The colour of marshy soils are dark grey or black due to presence of organic matter.